Operative linked to voter registration fraud still working for GOP? Questions continue to grow about Nathan Sproul and his various companies' multimillion dollar work for the Republican National Committee, despite claims that they've broken ties with him on the heels of a nationwide GOP Voter Registration Fraud Scandal. A virtual clone of his discredited Strategic Allied Consulting firm appears to still be operating on behalf of Republicans in at least 10 states. When the RNC invested $3 million to hire Strategic Allied Consulting, a company quietly created this August by Sproul, a paid political consultant to Mitt Romney, and then instructed state GOP affiliates in seven key battleground states (FL, NC, VA, NV, CO, WI and OH) to do the same, they knew very well about his companies' long documented history of alleged electoral misconduct and voter registration fraud. The longtime GOP operative's voter registration and "Get Out the Vote" firms have been accused, during election after election, of destroying and altering Democratic voter registration forms, though no formal charges have ever been filed against him, despite repeated urging from high-ranking members of Congress and others. Sproul's long track record of improprieties was bad enough that before they would give him the contract as their national voter registration group this year, according to Sproul himself, the RNC "asked us to do it with a different company name." 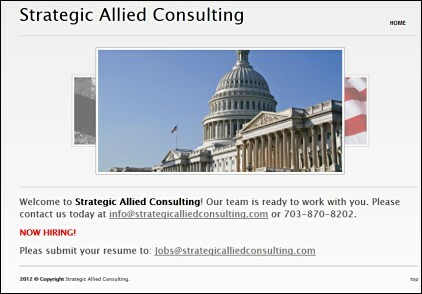 Subsequently, Strategic Allied Consulting is alleged to have collected fraudulent voter registration forms. Some of those forms had the addresses of existing Democratic voters changed so that some of Florida's county election officials now worry that voters could be disenfranchised when they go to the polls this November and find they're no longer registered at their old precinct, or even in the same county. The fraudulent forms were collected by Strategic and submitted by the Florida GOP (which paid Sproul's firm some $1.3 million for voter registration work, their largest single expenditure in the 2012 cycle) in at least 12 different FL counties. When the RNC then publicly claimed to have "fired" Sproul's new company, after the fraudulent forms came to light, it's likely that the RNC also knew full well that many of their state GOP affiliate organizations were still quietly employing Sproul's firms for partisan work in a number of other states. RNC spokesman Sean Spicer played dumb about having asked Sproul to create the firm without his name on it --- "To my knowledge, no one requested that" --- though Sproul told The BRAD BLOG during an on the record conversation, eventually aborted by his recently hired crisis manager David Liebowitz, that he stands by his assertion. "I'm not going to comment on this further," Sproul told us when we'd asked for specifics, since the RNC appeared to be calling him a liar, "but I'm not retracting my prior comments either." When we asked Sproul directly: "Do your other companies still work for the RNC or other state or local parties?" his response came back as a blunt, "No." In a response to a follow-up query, when we asked Sproul to explain evidence suggesting that his companies were, in fact, still operating elsewhere on behalf of Republicans, he walked back his original denial a bit. "I know you have additional questions, including many about SAC [Strategic Allied Consulting] and its affiliates and work we've done in other places and for other clients," Sproul said. "Those questions fall either outside the bounds of what I can discuss or outside the bounds of where I'm comfortable going in this story. I hope you'll understand." And yet, as still more evidence is emerging to show that Sproul may have been less than forthcoming in some of his responses to The BRAD BLOG (he has refused to respond to additional, specific follow-up queries on this emerging evidence after Liebowitz was brought on board as his crisis spokesperson), Congressional Democrats have similar questions about Sproul's work with the GOP and if it may be continuing even now. Sproul companies still at work for the GOP in other states? Shortly after the GOP Voter Registration Fraud Scandal first broke late last month,$430,000 in payments from the California Republican Party made to "Grassroots Outreach, LLC," a firm which shared the same corporate Tempe, AZ, address as Sproul's companies Sproul & Associates and Lincoln Strategy Groups. Most of the payments in this election cycle, according to the database, are said to be for "Signature Gathering" (presumably for ballot initiatives, etc. ), though $34,000 of those payments are noted to be for "Voter Registration." Sproul confirmed to The BRAD BLOG that Grassroots Outreach is, indeed, one of his companies, though he insists the CA database is in error, because, he says, his companies have done no voter registration in the state this year. "Those entries are incorrect," he told us. "We did not do any voter registration work for the [California Republican Party] in 2012 as indicated. I think its a simple mistake in reporting. I think that should have been for signature gathering as well." He also denied doing registration work in Oregon this year, despite evidence we detailed in our recent report showing that registration workers in Portland were seen using the same, deceptive tactics caught on video tape in other parts of the country where Sproul's workers were seen presenting themselves as pollsters, rather than registration workers, in order to screen for Romney supporters and filter out Democratic-leaning voters, so as to keep them from being able to register to vote at all. Flynn tripped across that information while looking into help wanted ads placed on Craigslist and elsewhere in North Carolina, seeking Republicans who were "self-motivated people to contact voters for the election ... interesting in helping Mitt Romney win North Carolina ... working with Voter Registration Projects and ... looking for team members to help expand Republican voter registration," etc. Now, Flynn has uncovered new evidence of another company calling itself "Issue Advocacy Partners." He documents help wanted ads, some posted as recently as September 26th, mirroring those published previously by Strategic Allied Consulting. "Some of the ads specifically mention voter registration," Flynn details, while others use "terms like 'seeking to hire grassroots canvassers to identify conservative voters,' 'voter recruiter,' 'conservative voter identification,' 'voter ID,' 'identify conservative voters.'" One of the ads Flynn found, posted on 9/27 and since removed, reads: "Issue Advocacy Partners is a conservative organization working to register voters as well as remind voters to vote conservatively in the upcoming election." 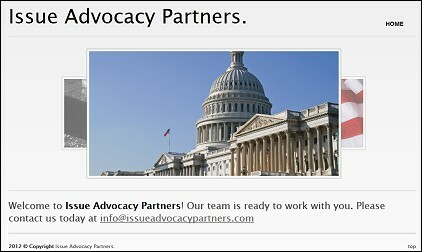 He writes that "Many of the postings use an email address with the domain issueadvocacypartners.com," before, most damningly, showing that "The website located at issueadvocacypartners.com has an appearance that is almost identical to that of the original strategicalliedconsulting.com." Indeed, Flynn appears correct again. From the evidence detailed above, it's clear that, despite the RNC's claim to have cut ties with Sproul and his own originally unqualified assertion that he and his companies were not "still work[ing] for the RNC or other state or local parties," there is a great deal of evidence that his operations are still working on behalf of Republicans in California and Oregon under the name Grassroots Outreach, and in Wisconsin, Iowa, Virginia, New York and New Jersey under the name Issue Advocacy Partners. Sproul has failed to respond to any more of our questions to date, so we've been unable to get his explanation for any of it, beyond what we've already shared, but now senior members of Congress are getting into the act, and are demanding answers themselves. Last week, three ranking members of high profile U.S. House committees sent a letter to RNC Chair Reince Priebus seeking more information about the RNC's work with Sproul. It was signed by Democratic Reps. Charles Gonzalez, Ranking Member of the Subcommittee on Elections; John Conyers, Ranking Member of the House Judiciary Committee; and Elijah Cummings, Ranking Member of the Committee on Oversight & Government Reform. The letter, which cites reports on this matter by The BRAD BLOG in a number of its footnotes, details the Republican Party's "unfortunate history of voter suppression" and its "Years of illicit and unethical behavior" which "led to the 1982 consent decree under which the RNC agreed to 'refrain from undertaking any ballot security activities' or anything else that might 'deter qualified voters from voting.'" "Despite your party's requests over the past thirty years, federal courts have repeatedly declined to lift that decree," the letter to Priebus continues. "The United States Court of Appeals for the Third Circuit on December 13, 2010, pointed to violations as recent as 2004 and found no evidence of 'any significant change that renders prospective application of the Decree inequitable.'" During the 2004 campaign, operating as Sproul & Associates, it was reported that his firm fraudulently altered and destroyed voter registration forms in at least two states. The firm was paid at least $8 million for its work, although the precise amount is unclear from the RNC's confusing financial disclosures. Apparently, the RNC was not dissatisfied with their work nor put off by their reputation because, in 2008, operating under the new name "Lincoln Strategy Group" the RNC again employed Mr. Sproul. In June of this year, the Romney campaign hired Mr. Sproul during the primary and has paid him at least $70,000. The RNC hired Mr. Sproul's firm, under yet a third name, as your only vendor signing up new voters. This repeated affiliation of the RNC with a man of Mr. Sproul's reputation for voter registration fraud and other forms of electoral skullduggery is deeply disturbing. 1) Why did the RNC and your state affiliates hire a company run by a man with such a long history of improper behavior? 2) Was the Republican National Committee involved in the decision to change the name of Mr. Sproul's company as he has alleged? Was this change in identity made in order to escape scrutiny for your decision to employ them? 3) For what other activities and in which states is Mr. Sproul or Strategic Allied Consulting engaged by or for the RNC or your affiliates? 4) Is Mr. Sproul doing business with the RNC under any other names? 5) What steps are you or the RNC taking with your present and future contractors to ensure that neither this alleged fraud or abuse, nor anything similar, occurs again or elsewhere? A spokesman for Gonzalez tells The BRAD BLOG that they have yet to hear back from Priebus, though their letter formally requests answers to those questions by next Tuesday, October 16th. In our article last week reporting that the Florida Dept. of Law Enforcement had opened an official criminal investigation of Sproul and his firm, we also mentioned that a similar letter was sent by Rep. Cummings seeking answers and documents from Sproul himself. And, on Tuesday, The BRAD BLOG has learned, Gonzalez sent similar letters to Karl Rove [PDF] and former RNC Chair Ed Gillespie [PDF] seeking their explanation for the nearly one million dollars which American Crossroads, the nation's second largest Super PAC, co-founded by the pair, paid to Sproul's companies during this election cycle. The letter to Gillespie, who left American Crossroads to become a senior adviser to the Mitt Romney 2012 Presidential Campaign, spells out Gonzalez' concerns, and hopes that the powerful former RNC Chair might be able "to reassure the American public by helping to explain the story behind these contracts." "American Crossroads, the Super PAC, which you and Karl Rove co-founded, paid at least $750,000 to companies run by Nathan Sproul, the founder of Strategic Allied Consulting," writes the Congressman. "The Romney campaign has paid Sproul companies at least $71,000 in the past year. Mr. Sproul has a reputation tarnished by allegations of voter registration crimes stretching from North Carolina and Florida to Nevada and Oregon and at least back to back to 2004," the letter reads. "By hiring his companies, the second largest Super PAC in the country and the campaign of the Republican presidential forerunning [sic] have affiliated themselves with him and supported his efforts. You can understand why Americans are troubled by the possible implications." 1) For what purposes did American Crossroads hire Mr. Sproul and what services did he provide? 2) Why would you associate yourself and your organization with a man like Mr. Sproul who has been dogged by so many allegations of voter registration fraud? 3) In light of the newest revelations about Mr. Sproul's activities, has Romney for President, Inc., severed its relationship with him? If not, what services are he or any of his companies now providing the campaign? 4) Mr. Sproul told the Los Angeles Times that he created Strategic Allied Consulting at and kept his name off of its records to prevent anyone connecting the firm to him and his shady reputation at the request of the RNC. Have you, American Crossroads, or Romney for President done business with Mr. Sproul under any other names? If so, what were they, what services did he prove, and what was he paid? 5) What were your dealings with Mr. Sproul or his companies while you were in the White House and during the 2000 and 2004 Presidential campaigns? Answer to those questions for Rove, as well, are requested by Gonzalez by October 23, "so that every American who is eligible to vote may go to the polls on November 06 confident that neither you nor any of your political organizations is engaged in an effort to undermine the integrity of our electoral process." For his part, Sproul vociferously defended his companies during our short time on record with him, pointing out that charges have never been brought against any of his companies over the years, despite evidence of improprieties in a number of states, during several election cycles --- and despite requests for an "immediate investigation" from the George W. Bush Administration's U.S. Dept. of Justice by Senators Patrick Leahy and Ted Kennedy as early as 2004 ... back during the period when the Bush/Cheney campaign had reportedly paid more than $7 million to Sproul for his services during their re-election campaign.